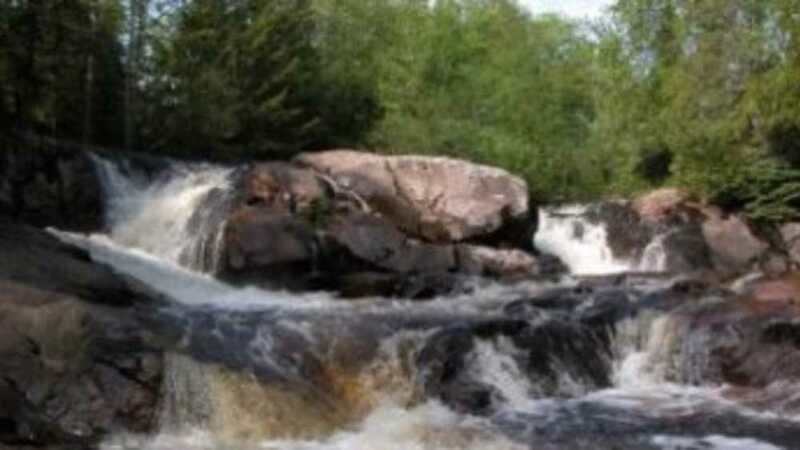 Yellow Dog Falls on the Yellow Dog River is approximately 50 feet wide and has a vertical drop of 30 feet. The distinctive feature is a massive lone bolder in the center of the falls. From Marquette travel County Road 550 north toward Big Bay approximately 23 miles to County Road 510. Turn left (west) on County Road 510. Travel about seven miles to the steel bridge across the Yellow Dog River. Park here on the left (south) side of the road. Follow the hiking trail on the south side of the river approximately 1/2 mile downstream. This is a nice walking trail with few ground obstacles. You will approach the falls from the top. (Note: View Big Pup Falls next). Physical exertion level: 6.